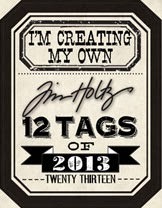 As soon as I saw Tim's tag for May I was absolutely in love with it...as many of you may have noticed I do love the found relatives and the photo booth and the textures and layers of collage just made my heart sing in this tag...so here is my take .. still keeping mostly neutral.. 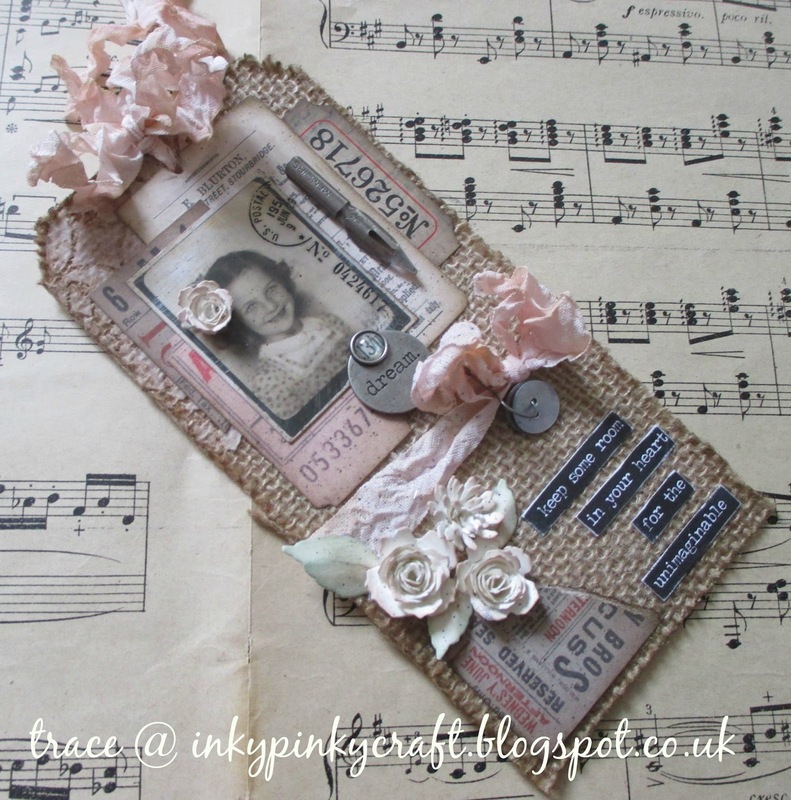 I just adored all the details of his gorgeous tag and just changed a few things..I added some seam binding dyed with tattered rose and my blooms were cut from ivory card and the just a smidge of tattered rose ink swiped over them. I followed most of the steps and all Tim's details can be found here. I just love the gorgeous burlap against the soft flowers and crinkles of seam binding...yum! I chose to add a flower to this gorgeous girl..the hardest part was choosing which of the photo booth pictures to choose ..there are so many gorgeous ones to choose from! I loved these flowers and the tool which comes in the pack made them easy to do... isn't she a sweetie! 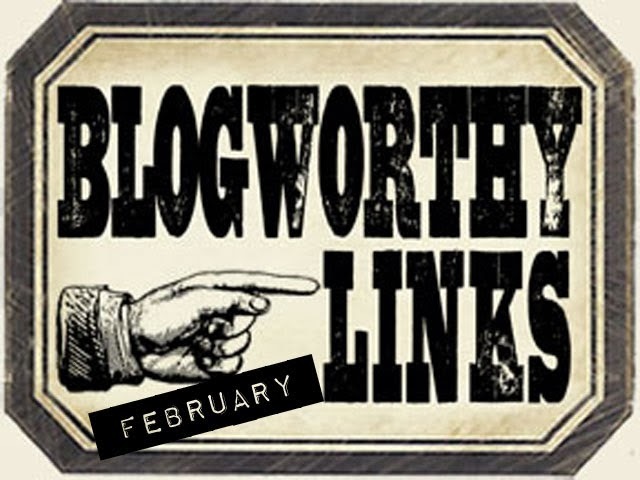 So I made it by the skin of my teeth and will be linking this up to Tim's tags here....not long to go and there will be another gem to inspire...I am sure.. but I have to say I do love this one! I started by covering the wrong side of the canvas and sides in tissue tape and smudging some peeled paint distress paint across it in patches. I then gave it a good spritz of pumice stone distress spray stain to give plenty of splatters. I found an old ikea mirror that had already been painted and crackled and thought this would make a good backdrop for my chemist's window. I added some peeled paint through patches of the new Tim Holtz brickwork stencil to make it look like a surround for the window. here is the window , complete with Chemist and the scene inside of the mad scientist creating who knows what?! i had great fun as always playing with idea-ology and love filling these little bottles! So hope you like my second piece for the simply scenic challenge over at Country View Crafts challenges. 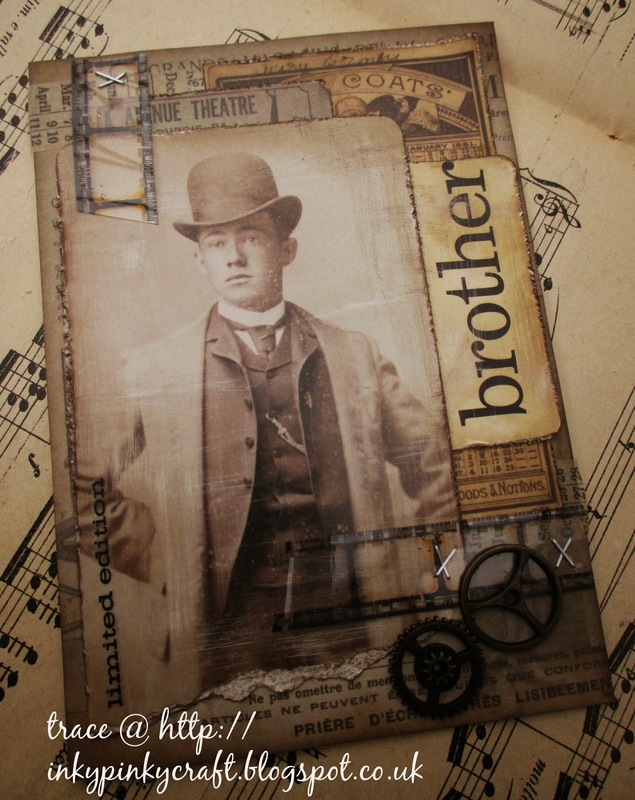 there is still time to enter..
Well it is my turn over at Country View Crafts and today I have a male card to share with you , full of layers and plenty of ephemera..with a smattering of idea-ology thrown in! 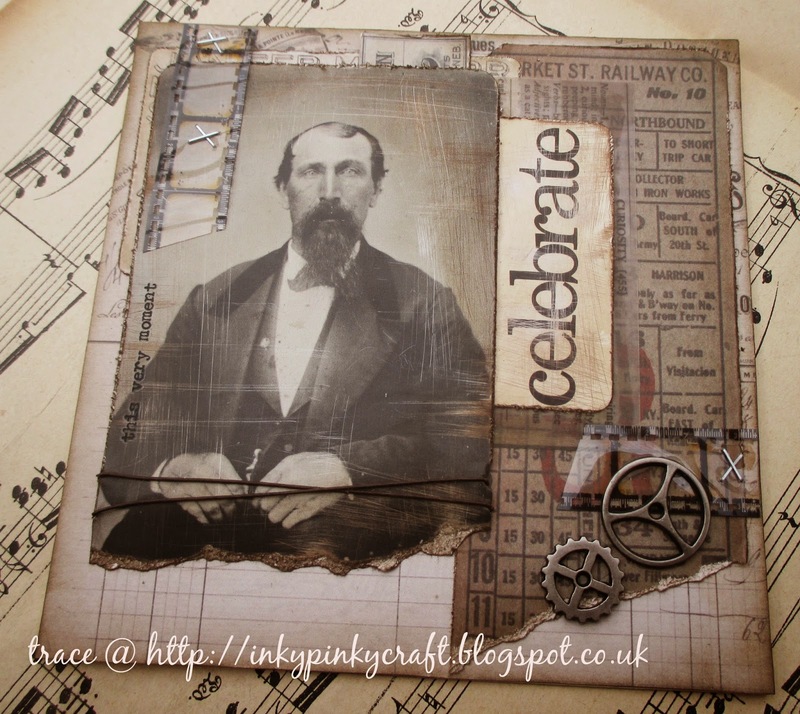 Well a shorter post today to share a couple of collage style vintage cards I have made. 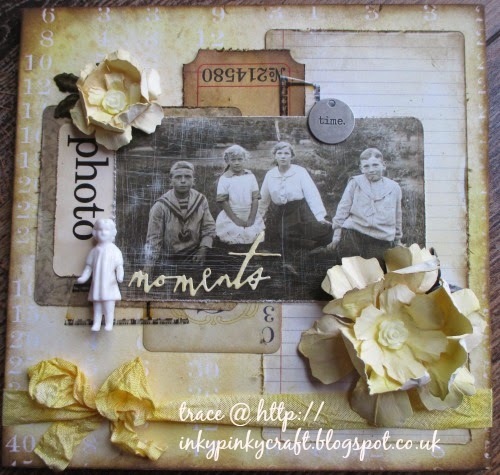 I am so loving playing with collage and feel I have really neglected my stamps...must remedy that really soon . 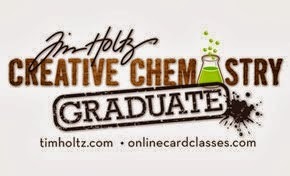 I just love playing with all those layers and delving in my idea-ology goodies to create these cards, a bit of scuffing and sanding, a smidge of walnut stain and there you have it! 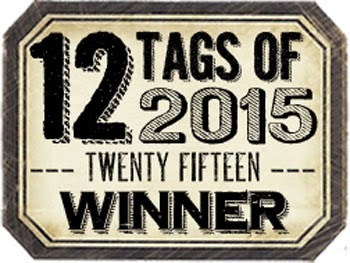 I know you may need a lie down after the shortness of this post! together is the best place to be for Country View Crafts. 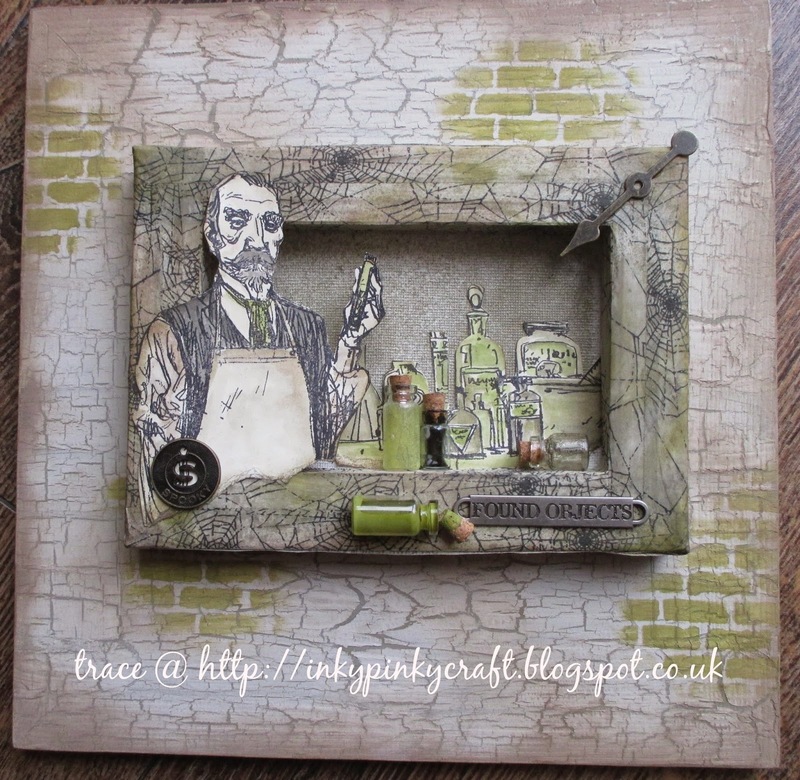 I started by covering a square of mdf and about creating my background with Tim Holtz paper, distress paint and then some decoart crackle paste through Tim Holtz new brick work stencil. Here is how it looked once the wonderful crackle has done its thing...I added some tissue tape from the new release to add some detail to the background and give a start to my scene building! Now for the details, I love making little houses and loved the look of this new die from Stephanie Ackerman . 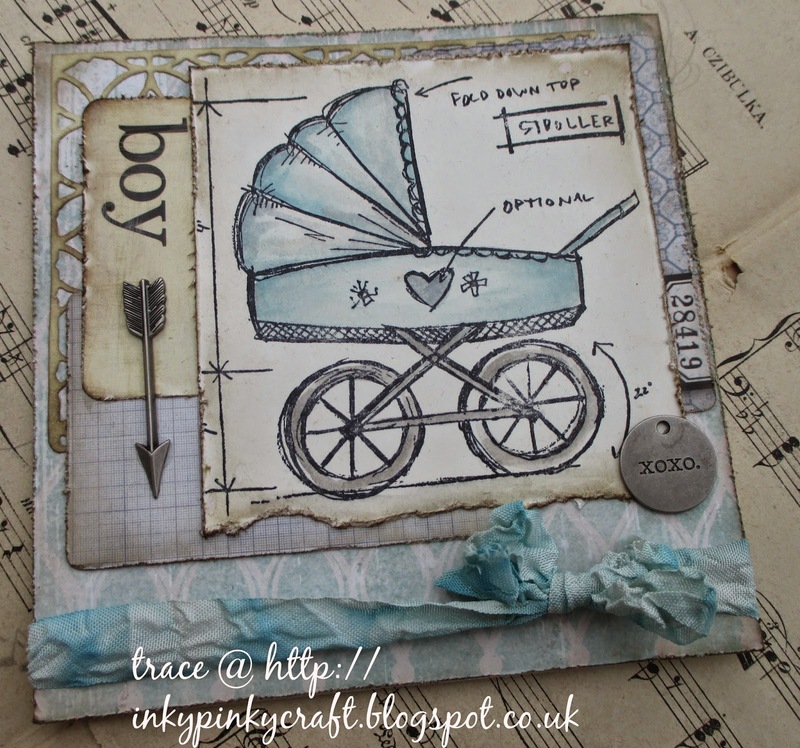 I die cut them from some of my favourite Tim Holtz papers and mixed and matched the houses . 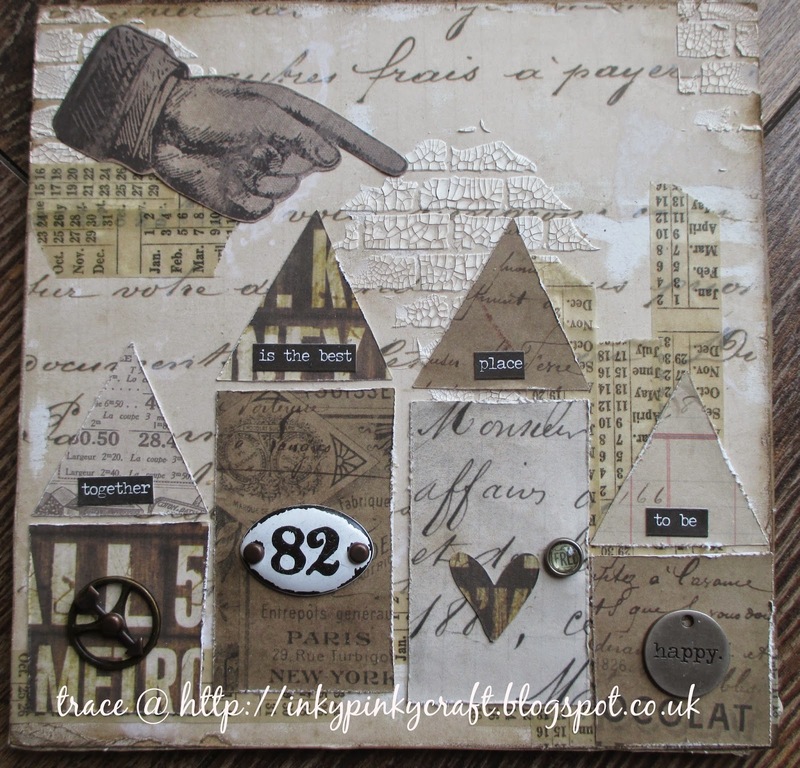 I stuck with neutrals and added plenty of idea-ology to add details to all the houses..
Just love this ephemera pointy finger! And here is the finished piece, I added a small talk sticker , cut into pieces . So hope you will find time to pop over and see all the scenic pieces, and remember you have a whole month to join in the fun...! plenty of time to have a play. 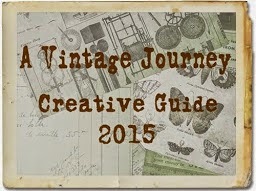 I had my DT piece for A Vintage Journey go up earlier and if you have time I would love you to hop here and have a look. So I started by covering my mdf square in the resist motif paper stack. I inked with scattered straw and squeezed lemonade two colours that I am ashamed to say don't get much of an outing.. I then spritzed some water and allowed the colours to drip, dried and spritzed with some distress spray stain. I just so love how the distress palette is so yummy and all three products just work so well together . I edged the whole piece in walnut stain distress ink to edge the whole piece.. and added some seam binding dyed with same colours of distress . I am not normally a yellow person, but this mellow yellow reminds me of the soft sunshine that appears in spring, although grey and rainy here today :( . Now for the fun , collage element, I tend to gather things together and faff about until I am happy, faff being a technical term for shuffle stuff about and waste a lot of time until it looks right , well to me anyway! 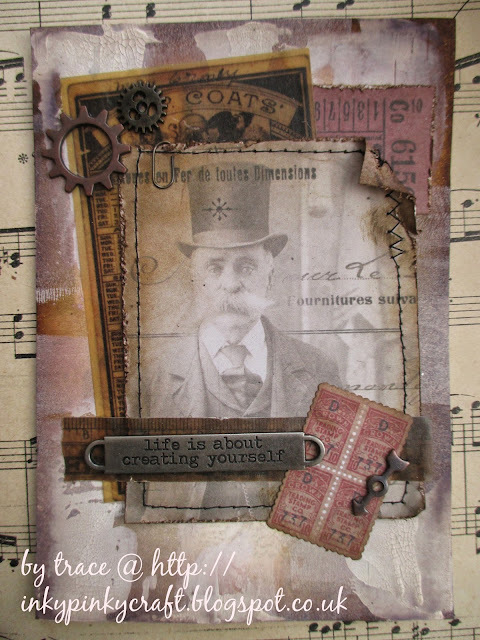 Now for the details ...as you know I have a teensy thing for the found relatives cards ..and yes another one found its way on here..scuffed and then various Tim goodies were added, a die cut word..loving these new thinlits! One of the new fractured dolls..yum! 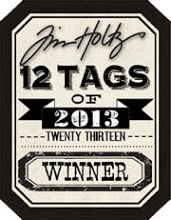 a typed token ..love these too...well lets face it I do have a small thing for idea-ology! I was so sad to see the fractured dolls go and am so pleased that they are back in some form...! I made some flowers using cardstock, coloured with distress and added resin flower centres from idea-ology range, dabbed with distress paint. and a smaller flower here ..with foliage leaves from idea-ology..
And this is how it all fits together, make sure you hop across to the blog here , for lots more DT inspiration..and remember you now have a whole month to play along with all your Tim inspired creations! 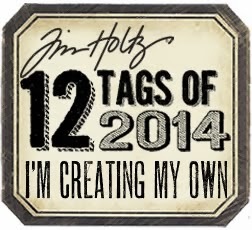 so why not join in the fun!